The invisible way to straighten your teeth, without metal braces. Invisalign can give you the beautiful straight teeth you’ve always wanted. It works through a series of invisible, removable, and comfortable aligners that no one can tell you’re wearing. So you can smile more during treatment as well as after. And with over 70% of US orthodontists now certified to treat with Invisalign, it has been proven effective in practices nationwide. Dr. Andrew was one of the first general dentist in the country to be trained and certified in the use of these invisible aligners. Invisalign is the invisible way to straighten your teeth without metal braces. 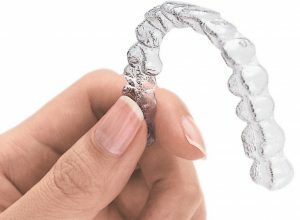 Invisalign uses a series of clear removable aligners (pictured to the left) to straighten your teeth without metal wires or brackets. Invisalign has been proven effective in clinical research and in orthodontic practices nationwide. In fact, over 70% of all US orthodontists are certified to treat patients with Invisalign. You wear each set of aligners for about 1-2 weeks, removing them only to eat, drink, brush, and floss. As you replace each aligner with the next in the series, your teeth will move – little by little, week by week – until they have straightened to the final position your dentist has prescribed. You’ll visit your dentist about once every 6 weeks to ensure that your treatment is progressing as planned. Total treatment time averages 6-18 months and the average number of aligners worn during treatment is between 18 and 30, but both will vary from case to case. Invisalign can be used to treat the vast majority of common problems for adults and teens. Whether your smile needs minor improvements or more extensive adjustments, Invisalign can certainly help. It’s successful in treating overly crowded or widely spaced teeth. It can also relieve more complex issues, including overbites, underbites and even crossbites. In fact, an Invisalign Certified Orthodontist or Dentist can use Invisalign clear aligners in all or part of just about any treatment plan. Because Invisalign uses clear plastic aligners to position and straighten teeth, you can keep your active lifestyle during treatment. Unlike braces, Invisalign aligners have no metal bands or wires to irritate your mouth. So go ahead and be as active as you like. Since Invisalign is removable, just take the clear aligners out for special events or if you’re going to indulge in a sticky, gooey snack. Of course you want to look great, at work, at school, with friends. Maybe you speak to groups or conduct meetings. You still can. Because Invisalign is clear and nearly invisible, most people will never know you’re straightening your teeth – unless you tell them. And when your course of treatment has ended, you can feel more confident, whether in front of people or not. You’re going to have a stunning smile. Invisalign straightens crowded, protruding, or spaced out teeth without the metal wires and brackets. First, we take a set of photographs and a 3-D scan of your upper and lower teeth. They are then sent to the Invisalign lab where there they use advanced laser technology to create an accurate 3-D image of your teeth. They send the images back to the office for you to get an accurate projection of the final results. Then a series of biocompatible aligners are made for you to wear. Every one-two weeks you change your aligner to move your teeth in tiny increments. You can change your aligner yourself you get faster results with fewer dental visits. You don’t have to change your homecare routines. You can take your aligner out to eat and to brush your teeth. Best of all you can still eat all your favorite foods without worrying about damaging or breaking any wires.